we have new stuff to eat. 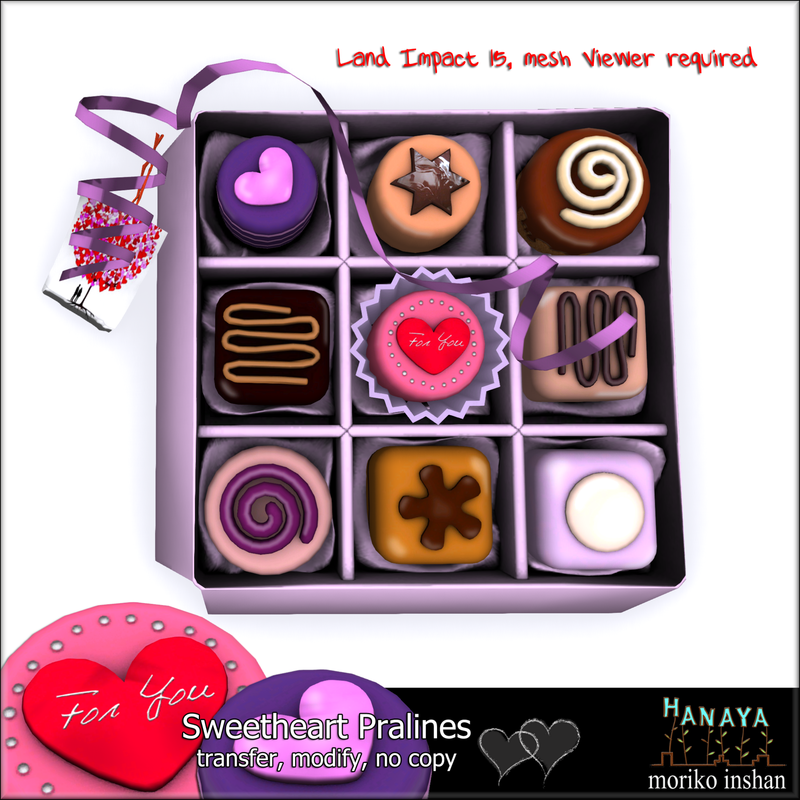 I could not resist paraphrasing this old silly poem, before showing you a bunch of brand new products from -Hanaya-, just in time for your shopping for your sweet Valentine. First up, and also my favourite, is a luscious box of adorable mesh pralines that will literally cause your sweetheart to reach out to their monitor to try to pluck one from its box and eat it. Embellished with a curly ribbon and a gift tag, it is 15 LI of sweet goodness. Want only a few? Try your luck playing our Sweetheart Pralines Gatcha. Each delicious bite is 15 Lindens each and includes an eating animation. With extra luck, you can get the rare item – the box to put the yummies in. Want to give your sweetheart something to which you can add your personal touch? Our Love You Photo Frame might be just the thing. To add your own photo, simply select the white heart insert area within the frame in edit, and add a photo from your inventory. 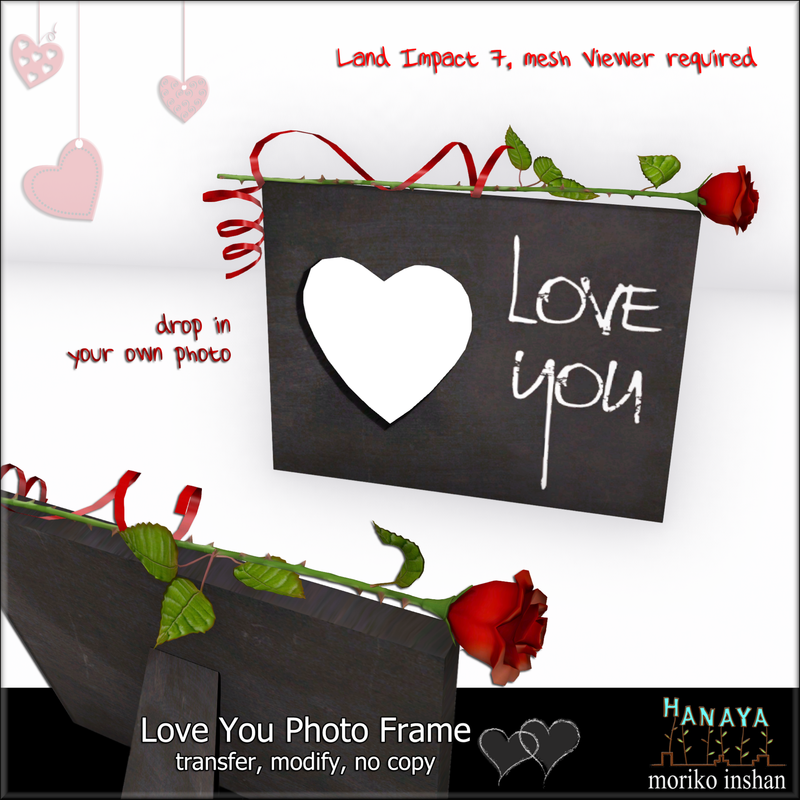 Land Impact of 7 including the mesh frame, curly ribbon and sculpted rose. My personal favourite activity on Valentine’s Day, in both real life as well as Second Life, is dancing. For our newest product, Let our Love Shine, is a romantic couple animation set, which includes synchronized couple animations that are accessed via a simple AVsitter menu (that means no pose balls). Choose from 2 couple animations – Gentle Kisses and Slow Dancing, and a static couple Photo Pose that lets you capture a still photo of your special Valentine’s moment. The animations and poses are contained in a rose petal base, which is embellished with sculpted rose leaves and buds. Three ball-shaped candles are positioned to cast a gentle romantic glow. 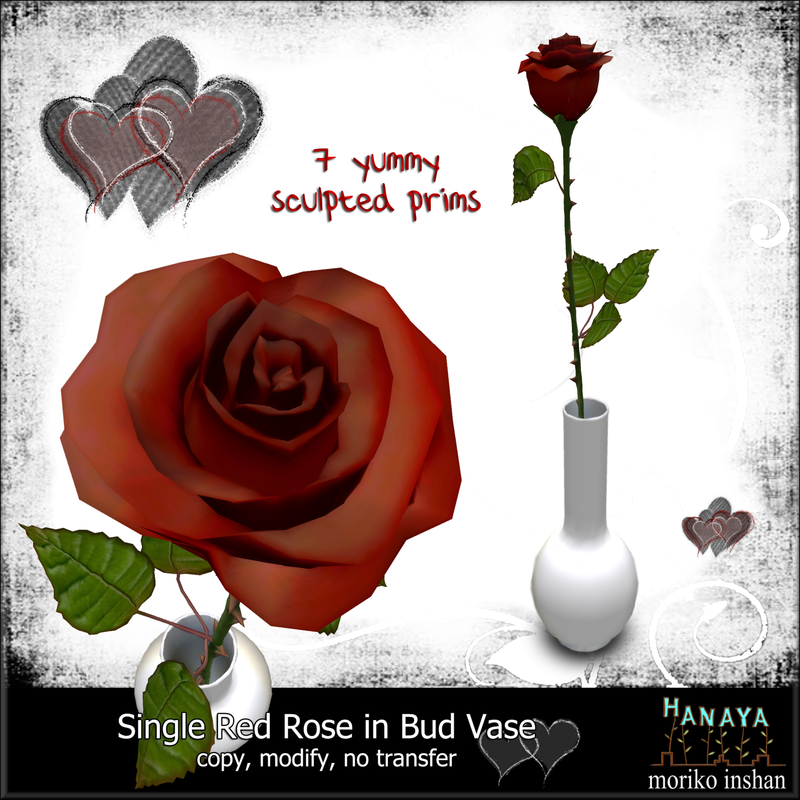 Last but not least, is a simple sculpted long-stemmed rose in a bud vase – just right for that small space in your home. 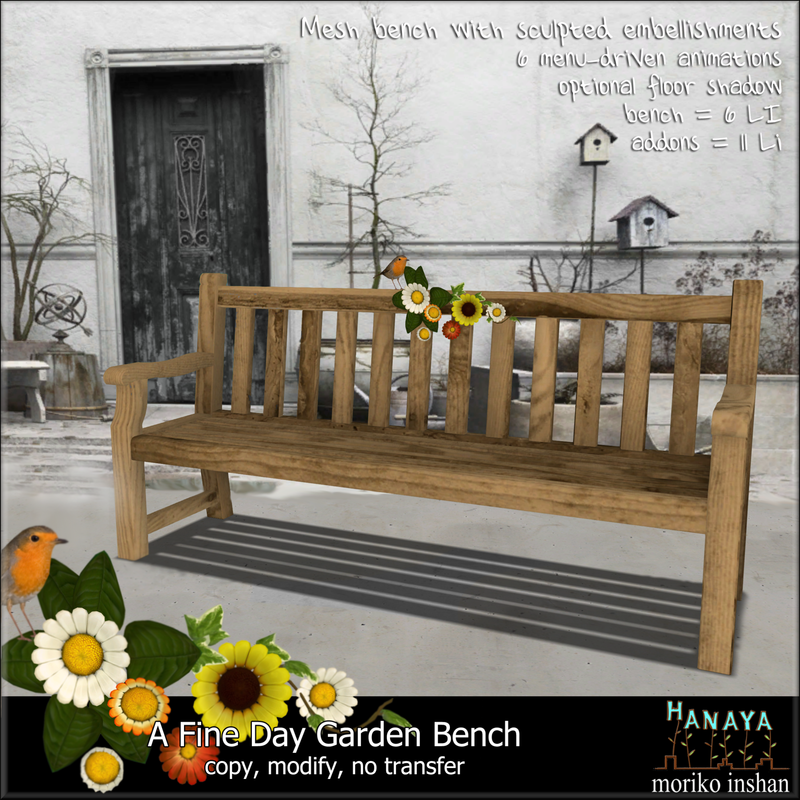 All of the new -Hanaya- Valentine’s Day 2013 Collection is available for sale at -Hanaya- in-world store as well as our web store on the Second Life Marketplace. 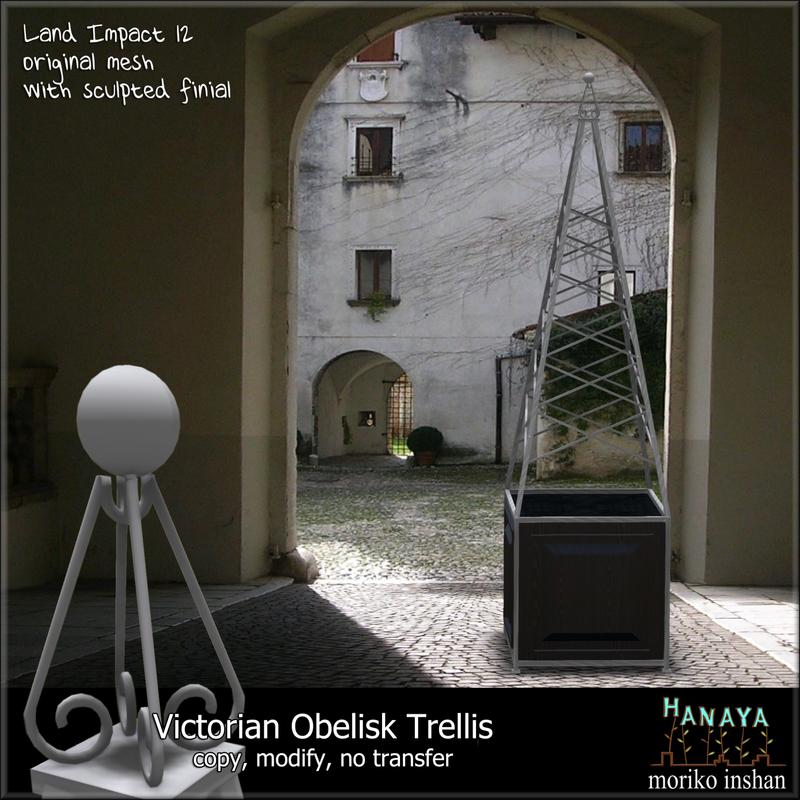 This entry was posted in Product Announcements on February 1, 2013 by moriko.